How can I communicate the values and mission of my estate plan to my family? Will my heirs know how to handle their inheritance? These are the real questions that many people leave unanswered, even as they sign estate planning documents. Successful wealth transfer planning does not happen in a vacuum. 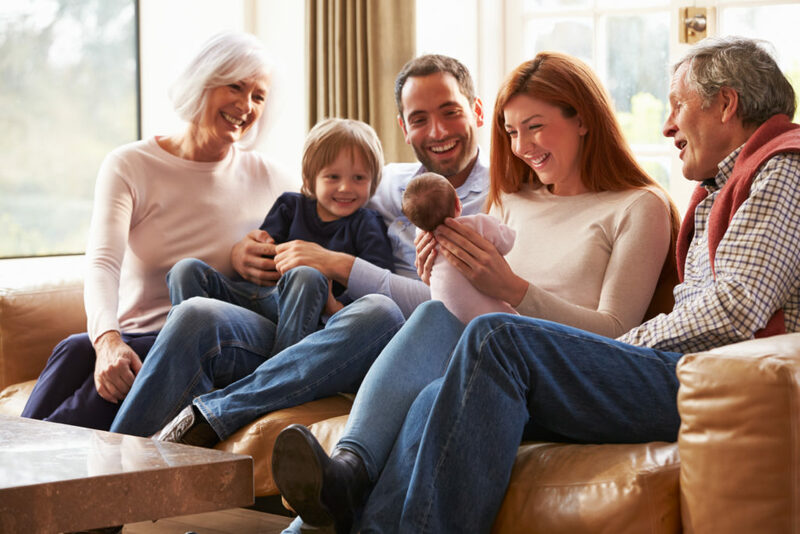 It’s likely that your family members will not understand the structure or purpose of your legacy plan without careful explanation and discussion. This is best accomplished through a series of advisor-facilitated family meetings. 1. Honest communication. The goals behind almost every estate plan go well beyond moving wealth around. We all strive to instill the values that lead to fulfilling and productive lives for our children and grandchildren. Meetings are powerful tool that families can use to communicate their vision for a healthy legacy. These meetings can build trust and help families grow and prosper across time. 2. Conversation started. For many parents, it’s difficult to unveil information about their assets to their children. However, the discussion can begin with a look into general philosophies about money management and the overall goals of the estate plan. This conversation need not include details about the scope and size of assets. 3. Discussing the psychological pitfalls of inherited wealth. Perhaps your heirs have never managed a substantial amount of money. Perhaps they have a sense of entitlement. What if the main thrust of your heirs’ retirement strategy is all about waiting on their future inheritance? Sharing your expectations, hopes and dreams for future generations can help avert the disasters brought on by these kinds of money madness. Conversations about family strategies for education can be especially powerful. Even the best estate planning structures are not enough to protect assets from heirs who have not been prepared for their inheritance, from trust and communication deficits among family members, or from the failure to share a clear mission for family wealth. 4. Introduces the next generation to a seasoned advisory firm. Your heirs might not have accumulated the minimum in assets that seasoned advisory firms often require. However, some firms welcome the chance to serve the next generation, especially those of clients with whom they have long-term relationships, regardless of account size. These well-established firms are often prepared to match younger clients with their younger advisors who are better suited to develop the best rapport with them. And, of course, getting an early start with a trusted financial planner can make a crucial difference in your heirs’ own lifetime accumulation of wealth. 5. Increases probability of legacy success. Unfortunately, many wealth transfers do not go well. 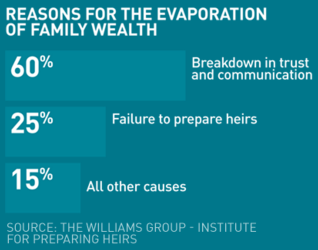 In their 2003 research, independent wealth transfer consultants Vic Preisser and Roy Williams found that 70% of family money evaporates by the end of the second generation, and 90% by the end of the third generation. Assets are depleted and family relationships may be damaged in the process. Even the best estate planning structures are not enough to protect assets from heirs who have not been prepared for their inheritance, trust and communication deficits among family members, or the failure to share a clear mission for family wealth. 6. Prepares you for the possibility of needing your children’s help. Will you be able to afford eldercare? If not, can your children afford it? Who will be responsible for this potential transition? Planning ahead will allow you to prepare for issues you may encounter later in life by using sound principles, and not the emotions brought on by an event-driven crisis. ♦ The extent of the information that will be shared is defined ahead of time. ♦ It takes place in a neutral setting. ♦ All of the professionals on your team who you would like to participate are present. ♦ Your advisor connects with the next generation. ♦ Through education, your heirs are prepared for their inheritance. ♦ The setting allows for honest and collaborative communication even for those who cannot physically attend the meeting. ♦ The values and mission of your estate plan are explained. ♦ Questions are asked and answered. A conversation with your advisor is the best place to start when you’re thinking about bringing your family to the table to discuss your legacy goals. He or she can help you decide who should attend a family meeting, think through the best ways to approach your children (or your parents), and set the agenda and rules for your discussions, including topics that may be off limits.  Whether you’ve already reached out to family members about the future of your wealth or you’ve only begun to consider it, talk to a TGS advisor. We can help ensure that your plan is in place and your family team is on board.